Thanks to its privileged geographical situation, Alsace is the driest wine region in France. Its micro-climate is caused by the distance which separates it from maritime influences, and by the protection of the Vosges mountains. This climate enables the grapes to ripen slowly to full maturity, giving the wine great finesse of aroma and unequalled intensity. 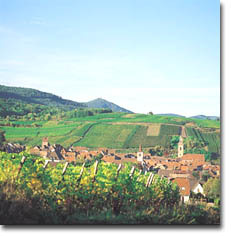 Because of its complex geology, Alsace has an infinite multitude of combined soil types. Centuries of experience have taught the winegrowers how best to match each vine variety to each type of soil. From the Middle Ages, Riquewihr was renowned for "the most noble wines of all the country". The Hugel family’s vineyard estates cover more than 25 hectares, exclusively in Riquewihr, and almost half of which are in the Grand Cru zone. No use of fertiliser, low yields, vines averaging thirty years of age, thinning out of excess bunches, and picking always by hand, are all factors which contribute to rigorously high levels of quality. In addition to its own estates, the Hugel family purchases grapes and grapes alone, from growers under long-term contract, farming more than 100 hectares. Thanks to the skill of their growers, a dozen of the best villages of Alsace thereby contribute to the quality of "Hugel" wines. Their grapes are also always picked by hand, and according to a pre-arranged timetable.